The first sentence just struck me wrong. “Everyone goes through hell”. Really? Is there different levels of ‘hell’ that everyone goes through? The HELL you are, or did go through while involved with a Sociopath is a HELL no one can even begin to understand or comprehend. How do you describe to someone mental and emotional manipulation? How do you described to someone the verbal lies over and over, the attack on your self-esteem, the attack on your self-worth during the relationship with a Sociopath? How do you defend yourself against a Smear Campaign? You cannot describe that kind of HELL to someone. When the abuse was done it was over a period of time, and it was done systematically and methodically. Again, how do you describe that to someone who has not had first person experience with a Sociopath?? The second sentence “stop tormenting yourself by reliving the pain over and over”. Really? How about this person who wrote this positive quote or whatever you want to call it, live day in and day out with tormenting done by a Sociopath. Most times silently, some times by their actions, and always by their words. That is tormenting. You cannot just simply STOP reliving that pain! It is real, it is raw, and it is deep. And for some it is ongoing for years!!! Let’s be realistic, how does a person just ‘stop’ their though process? Do you get some Fairy Dust and sprinkle it on yourself? 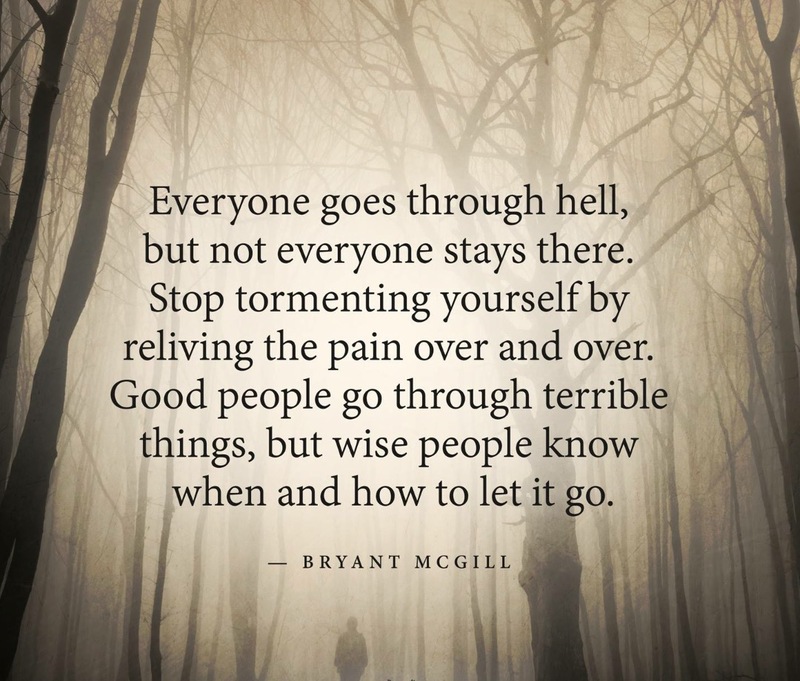 The last sentence, “Good people go through terrible things, but wise people know when and how to let go”. Really? So basically I read this as, if you haven’t ‘let go’ you are not ‘wise’. Again, how many times have you let go? How many tears have you cried over the abuse done? How many months and years of torment did you live barely survive through? How do you just ‘let go’ of the deception done? The lies said? How do you just ‘let go’ of all the manipulation done to you, the daily torment of living with a personality disordered person? How do you just ‘let go’ of all of the love, forgiveness, begging, pleading, praying for the Sociopath to change? You simply don’t. It takes a very, very, very long time. Some of you may read these kind of positive quotes, and if they help you, that is terrific. Be mindful though, that I’m pretty sure this person has not been involved with a Sociopath/ Narcissist, Psychopath. When you are searching for ways to heal, reach out to someone who can relate on a first person basis to what you barely survived. Positive quotes are good! We all need positive in our lives. Sometimes thought when you read something like this, it can make you feel like a failure as “wise people know when and how to let go”. And wise people also know, this is not done over night, or in one day.